The Center for Energy Research at the University of Duisburg-Essen (CER.UDE) brings together diverse activities in energy research from the natural sciences, engineering, economics, and the humanities. Associated research institutes and industrial partners also play an important role by helping to ensure that viable technologies are developed and transferring findings from the laboratory into real-world applications. 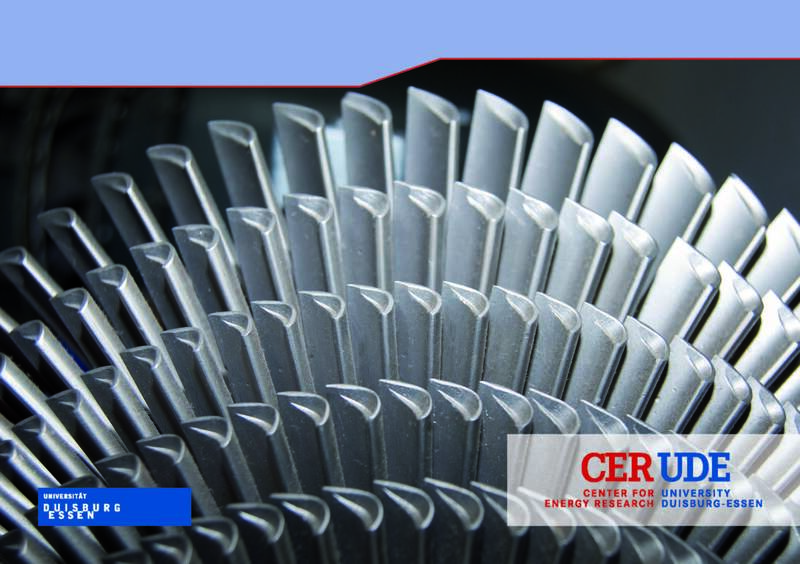 CER.UDE’s mission is to make a significant and meaningful contribution to the creation of a sustainable energy system that is environmentally friendly, reliable, low risk, economically viable, and widely accepted by the general public. In the Faculties of Physics, Chemistry, and Engineering, energy-related research topics are diverse and include investigations into elementary energy transfer processes with ultra-high temporal and spatial resolution (in the collaborative research center „SFB 616“ (see p. 21 for more information)), reaction rates and mechanisms of chemical reactions in shock tubes, and laser diagnostics in flames and engines. This area of research focuses on innovative processes for the economically-sound, safe, and sustainable generation of power. This includes centralized power generation from fossil fuels in large power plants, such as steam power plants with high live-steam parameters; gasification power plants; combined cycle power plants; and decentralized power plants for local energy supply as small as a few kilowatts for isolated applications. The increasing share of renewable and distributed power plants in Europe requires a significant expansion and restructuring of the German and European power grids, so that electrical energy that is generated remotely can be transported to the major metropolitan areas where it is needed. Energy transformation and utilization are embedded in complex social processes. Energy economics and trading on the international energy markets make up a particular focus at the University of Duisburg-Essen, where research is undertaken with an integrated view of the financial and energy markets. Auf der HANNOVER MESSE 2012, 23. bis 27. April beteiligt sich das ZBT traditionell am Gemeinschaftsstand des Landes NRW in der Energie-Halle. Für die dezentrale Stromversorgung und Kraft-Wärme-Kopplung werden Reformersysteme zur Wasserstofferzeugung, Brennstoffzellenstacks und Systemkomponenten gezeigt. Eine innovative Fertigungslinie zur Herstellung von Mikrobrennstoffzellen mit funktionalen Prüfungen und vollständiger Rückführbarkeit wird erstmalig vorgestellt.